The City of Johannesburgâ€™s â€˜protest feesâ€™ are a major free speech violation, and nobody seems to care, write MURRAY HUNTER and THAMI NKOSI. Have you heard about the #JoburgProtestFees? We know it sounds crazy, but yes: the City of Johannesburg wants people to pay a fee before it legally recognises their right to protest. So, Section 17 of the Constitution says you have a right to protest, but in Jozi, the Johannesburg Metro Police (JMPD) want you to reach for your wallet before it agrees. 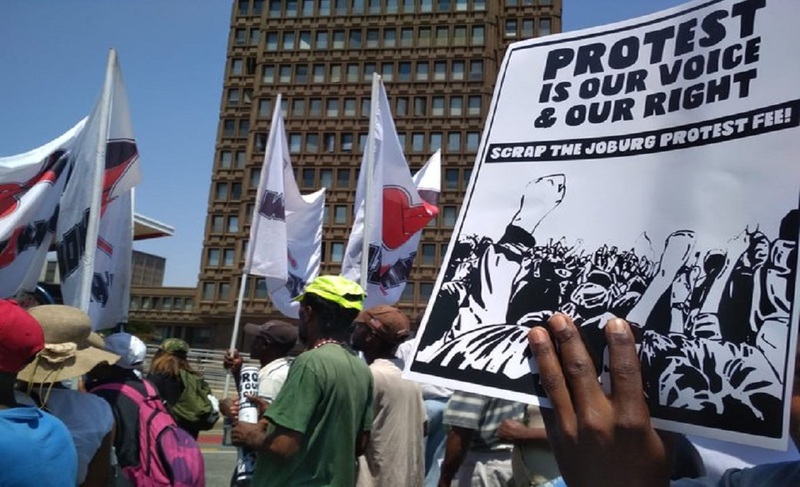 Now community activists are calling for an end to #JoburgProtestFees once and for all. Why does this matter? Because protest is a basic tool of freedom of expression, and it is used most of all by poor and marginalised communities. And for years, the wealthiest city in Africa has used these fees to put a price tag on that right. Letâ€™s be clear: the national law on protests, the Regulation of Gatherings Act, is seriously problematic (and pre-dates the democratic era). But it does not allow fees to be charged for people wanting to protest. Yet in Jozi, it starts with a R 180 â€˜planning costâ€™. The Regulation of Gatherings Act says protest organisers should notify the municipality of any planned protest, with some basic information about the plan. The city officials are required by law to process this notificationâ€“ but in Joburg, they want you to pay R 180 before theyâ€™re willing to do so. After that, the fees can run to thousands of rands, as JMPD also then asks protest organisers to pay in advance to organisers to â€˜hireâ€™ the police and the vehicles that will be deployed at the march. Even though it is their legal responsibility to be there. For example, this year on 16 June, police wanted about R 3000 before they would allow a youth march from Alex FM station to highlight violent crime. How can these people keep a straight face when theyâ€™re asking unemployed youth to pay out of their pockets for a Youth Day commemoration? How did we even get here? The protest fees policy, which dates back to the Parks Tau era, uses a local bylaw that applies fees on â€˜special eventsâ€™. But the bylaw applies to commercial and recreational events such as street festivals or fun runs. It clearly doesnâ€™t extend to protests, which are constitutionally protected. The fees are basically exploitation of the poor. It would be no different than forcing people to pay a fee before allowing them to vote. Thatâ€™s why the Right2Know Campaign has always refused to pay the Joburg Protest Fees, and advise all protest organisers to do the same. But for everyone who refuses, many others are still being asked to pay. And itâ€™s also why, after years of trying to engage officials to drop this policy, we marched last week to Mayor Mashabaâ€™s office, demanding for #JoburgProtestFees to be scrapped. A City spokesperson has argued that the fees are needed to cover the cost of local officials who oversee protests. And they say thereâ€™s a discount that reduces fees for some protests. In other words, if the City has a responsibility to enable our right to protest (and it does), it needs to bear the costs. Funnily enough, Jozi is the only major city or municipality in SA that thinks it can charge protest fees. But they do have an ally in Donald Trump, whose administration is considering implementing protest fees for exactly the same reason. But the #JoburgProtestFees are just one example of how, in Jozi and across the country, local government officials are denying and repressing communitiesâ€™ right to organise. Even though the Constitutional Court has struck down one part of the Regulation of Gatherings Act (you are still required to notify the municipality if you plan to protest, it wonâ€™t be a criminal offence any more if you donâ€™t the real battle will now be in municipalities. Across the country, officials are twisting the law â€“ or just ignoring it â€“ to intimidate, dissuade and repress the communities from exercising this right. Herman Mashaba has one chance to do the right thing: Scrap the Protest Fees!